Wild Play Superbet slot belongs to Nextgen's 'Superbet' series. 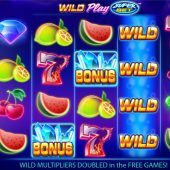 These are games where by betting more you can raise the game's RTP slightly by buying extra multipliers and symbols or easier access to features. Possibly the most notable examples are Double Play Superbet and Extra Cash and we even see the Superbet feature on Merlin's Magic Respins too. In this instance though we have a futuristic neon theme with retro symbols and transparent reels over a pastel background and 5 betting level options. So is Wild Play Superbet worth paying this extra money for? There are 40 pay lines over 5 reels of 4 rows each and all the symbols are single bar the Wilds appearing on reels 2, 3 and 4. You pay 50 coins for these 40 pay lines and the Wilds are where your extra stakes come in to play. Pay 100 coins and your stacked Wilds get a 2x multiplier, 200 coins a 3x multiplier, 250 coins for a 4x multiplier and the top Superbet level of 300 coins earns you a 5x Wild multiplier. These multipliers add together so any win for example when you play the top 300 coins stake that involves 2 Wilds will pay 10x and across all 3 reels will pay 15x for any win lines. The icons are old fruit machine symbols and you get 6x bet for the 7's if you land a 5-of-a-kind win, 3x bet for the green or blue gems, 2x for the bells and 1x for the melons. There are no card values but we get just cherries or lemons for 0.8x stake for a full 5. There are Crystal 'Bonus' scatters on the middle 3 reels and these are what we need for the game's bonus round. Having landed 3 Crystal Bonus scatters on the centre 3 reels we are awarded 10 free spins. Your Wild multiplier is doubled now for the duration of them and they can be retriggered too. If you pay 300 coins for the top 5x multiplier you will get up to a possible 30x on some wins as your stacked Wild is now worth 10x for each one involved in any winning line.